MANILA, Philippines – The Iron Butterfly is still here. 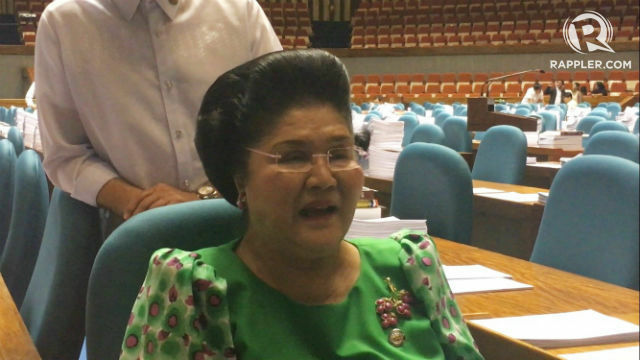 Ilocos Norte 2nd District Representative Imelda Marcos was an early bird during the House session on Monday, May 8, several hours after social media went abuzz about her supposed death. “Ito, buhay pa (I’m still alive)… [I’m] very well,” said Marcos, who was wearing a green terno. 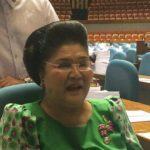 “Ito nakakapasok pa ‘ko sa Congress tsaka nangunguna kami (I still go to Congress and I’m even early),” added Marcos, who was surrounded by her staff as she spoke to the media. The 87-year-old had to ask for her staff’s help to clarify questions from reporters. 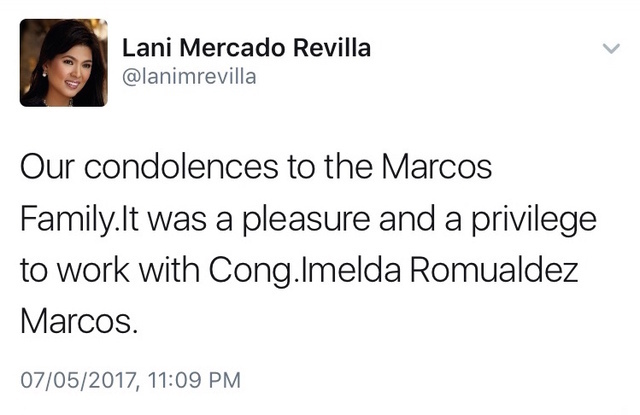 Late Sunday evening, May 7, Bacoor City Mayor Lani Mercado-Revilla tweeted her condolences to the Marcos family for the supposed death of the family matriarch. “Our condolences to the Marcos family. It was a pleasure and a privilege to work with Cong. Imelda Romualdez Marcos,” said Mercado-Revilla, who was previously Cavite 2nd District representative. Revilla deleted the tweet about a minute after posting, but netizens were quick to take screenshots of her post. The Bacoor mayor then tweeted an apology on Monday morning. “I would like to apologize for my tweet which I have erased. I received a news break message informing the public about Mrs. Marcos,” said Revilla. But she also deleted the apology tweet. A staff member of her cousin-in-law, Cavite 2nd District Representative Strike Revilla, then told House reporters that the Bacoor mayor’s Twitter account was supposedly hacked. “Hindi si Mayor ang nag-send ng condolences kay Mrs Marcos. Hindi din siya ang nag-send ng apology. Her account was hacked. Pinapa-investigate na kung ano nangyari,” said Amy Manzo.